Because getting a web site can be needlessly daunting, we can make it as simple and quick for clients as providing a bio and a photo. You don't need to know anything about computers because we do it all for you. However, for those who want to know more about web sites first, here are the details. Q: What goes into a web site address? A: Every web site has a unique address so it can be located. A web site address looks like www.name.com. Each part is separated by a period called a "dot." There are no spaces. Capital and small letters are interchangeable. The full address may be http://www.name.com, with http (hypertext transfer protocol) for a language used to transfer web pages among computers. Because http and www are redundant, it is sometimes shortened to name.com. Every page within a web site has its own URL (Uniform Resource Locator) address. A domain name can be a person's name, a corporation's name, a description of services and products, a made-up word, etc. with a dot suffix. Although the part between www and the suffix can be combined with more than one suffix, each domain name is unique to the site and may not be used for any other site, anywhere in the world. A site can have a more than one domain name pointing to it. The three letter suffix, referred to as "dot suffix" or extension, identifies the web site's category, such as com for commercial, org mostly for non-profit organizations, gov for government, edu for educational, net for Internet companies, etc. Dot com is still the most popular and prestigious, but if it is already taken, other suffixes may be appropriate. It's best to have your own domain name, rather than a domain name that appends yours as a secondary name with "forward slashes" because your own domain name is shorter, easier for people to remember, and promotes you, not a phone company, Internet Service Provider, or a web site with your competitors. Q: How is a domain name obtained? A: After devising a domain name, its availability must be checked. If it is not already taken, it can be registered, i.e. its usage rented for a period of time from a registrar. Registration of domain names is for a year and multiple years and renewable. Web Sites and Sound Bites?/sup> not only develops domain names and obtains their registration, but registers them in clients' names (rather than own the registration as some hosts do). Both services may be included without additional cost in our server hosting package. Q: What is a web site server? A: A server is a big computer. A web site must reside on a server, which is programmed to transmit it to the Internet. Except for large companies, a server is usually shared (note sharing is of the machine, not the domain name). There is no geographic proximity requirement for a web site and server machine; everything is electronically transmitted. Rent is for space on the server and for delivering the stored data to computers everywhere. A host (often the web designer) is the manager of server storage, transmission, technical support, etc., in a package. Web Sites and Sound Bites?has server hosting packages for our clients. Our packages provide detailed site traffic statistics (by hour, entry page, exit page etc. ), e-mail boxes and forwarding, secure server, 24/7/365 tech support, and the availability of shopping carts, poll takers, surveys, guest book, and lots of other features. They are attractively priced. Rent for server hosting should not be confused with monthly maintenance. Although monthly maintenance (checking web sites after they are running) is charged by many web site designers, Web Sites and Sound Bites?nbsp;does not charge a monthly maintenance fee. Additions and updates are on an ?la carte fee basis. You only pay for what you want and get. Q: Do I have to order a domain name, server host, and web design from different sources? Web Sites and Sound Bites?/sup> can do all of these essential ingredients for you: obtain domain name registration, arrange server hosting, design your web site, provide advice, and coordinate it all. One stop convenience. Q: What goes into designing a web site? A: Professional web site designers develop the entire web site, from planning it to uploading it to the Internet. The designer is responsible for text, graphics (photos, logos, and other art), layout, colors, font style and size, navigational structure and internal links to travel around the site, and external links to connect with other sites. It is very important that the designer understand the site's content and how search engines pick up information in order to devise the best metatags (information about the page, in contrast to coded tags that determine how the page is displayed) including titles, descriptions, and keywords; design attributes; and links. The designer uses HTML (Hyper Text Markup Language) code to convey structure, text, graphics, and layout of web pages and how they are linked. Special skills, such as a sense of aesthetics for attractive graphics and good spatial perception for page layout, are important. It is essential to know how people process information. Products to produce an attractive and unique web site include OCR software, graphics programs, and licensing rights for photos. They can run up a big tab, but Web Sites and Sound Bites? provides these for our clients. Furthermore, we can edit your own photos appropriately for your site. We also have the capability to edit and upload video and audio on your site. The web site designer should understand both the client's work and search engines to develop the best traffic attractors. Fill-in-the blanks web sites, templates, and do-it-yourselfers lack the capability to build sites to attract search engines well. Q: How much control do I have over what is on my site? A: Web Sites and Sound Bites?welcomes client's comments throughout site development. In fact, we post web site drafts online so designer and client can view and discuss them without public visibility. We never publish a web site for the public to see without the written approval of the client. Since some clients like to delegate and others like to control, we invite clients to decide how much they want to be involved in the process. Q: Is it possible to do a web site myself ? A: Sure, you can do your own web site, by learning web design or by filling in boxes in a template, which is simply a form for a prefabricated web site. You can also do your own taxes, plugging numbers into a computer program. But you probably don't because you know a CPA can do a better job, save you money via advice and time (in which you can be earning money), and take over an annoying chore. Here's a quiz to help you decide whether to do your own site. The reasons people use template web sites is because they don't have to learn to do complicated technology. However, even bypassing complicated technology, writing well for the web is not as simple and quick as assumed. Most people don't know how to write for the web, which is not the same as writing books and articles. What they write may be grammatically perfect, but wordy, repetitive, boring, and stilted. Wordiness is not only cluttered, unattractive, and overwhelming, but communicates poorly and may make the viewer give up. A do-it-yourself web site is not necessarily cheaper. Even writing text to fit in a box on a form can be very time consuming for you. How much do you earn per hour? Multiply that amount by the number of hours it will take you to do your own web site. That is the real cost of a web site. It may be far more expensive to do it yourself than to hire a web designer who can design a site in much less time. Unless you really prefer to do web design than what you do for a living, it would be more cost-effective and have better results if you give the job to a professional. Just as you go to a surgeon, accountant, or lawyer rather than do-it-yourself and you seek objective opinions, professionals, such as Web Sites and Sound Bites? know how to write for the web. Q: What are the problems with a template web site? A: The expression, "one size does not fit all," sums up problems with templates. For instance, a site that is appropriate for a bar and grill is inappropriate for a member of the bar, an attorney. Typical problems are looking too much like the web sites of competitors and looking amateurish. A template is a form with spaces to fill in and thus very limited. Just like a directory, it provides basic information, but only what can be filled in the boxes. It does not enable flexibility of placing things anywhere on the page. Rigidity is not the only problem. It does not convey high quality. Business luncheons are not held waiting on line for ready-made burgers at fast food chains because the food and atmosphere are not appropriate quality. Likewise, templates do not impress potential and current clients with the quality of your firm, customization, and professionalism. Don't be fooled by web design companies that claim they don't use templates, but really do. Instead of starting from a blank screen and building a unique web site, they may simply be filling in templates for you. Be suspect if the offer is too cheap to be true or they only use data you provide without editing or contributing expert advice. A: As the name suggests, a browser is a software program that locates and displays web pages so you can surf the Internet. Originally only able to display text and graphics, browsers now provide interactive functionality and multimedia presentations with audio and video components. There are many types of browsers and versions of each. The two most popular browsers are Internet Explorer and Netscape Navigator, with Internet Explorer used by most people. You can install multiple browsers free. Update the latest versions to get new features and patches (fixes) of problems noted after release of the software. Q: What determines how a site looks? A: One of the most frustrating aspects of web design is the impossibility of identical site appearance on different computers. The browser and its version are big determinants of each site's display. A major variable is the curvature of the screen, from flat to significantly curved. The size, resolution, and settings of monitors also affect the display (just as the settings on TVs affect colors as you've noticed when someone looks orangey on one set, flushed on another, and jaundiced on another set next to each other in stores). Computer brand and age also affect appearance. 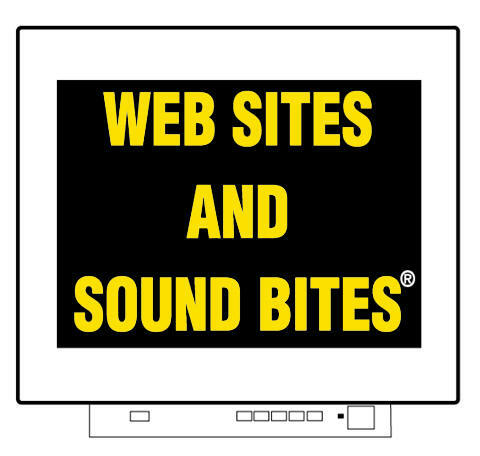 Web Sites and Sound Bites?tests its sites on different browsers and monitors to obtain as much uniformity as possible. Q: How is traffic attracted to a web site? A: Attracting traffic to a web site should be planned at its inception. Web designers build in attractors for search engines by using the most appropriate design attributes; titles, descriptions, and keywords known as metatags; links; and other features. Web sites using templates (pre-fabricated forms) do not have the capability web designers do to attract search engines and analyze traffic reports (by the hour, day, entry page, exit page, most popular pages, etc.) for fine-tuning. Site owners should participate in promoting their sites, such via word-of-mouth networking, business cards, and ads that can be brief and inexpensive by referring to the web site address to obtain its abundant information. We provide tips for increasing traffic and other marketing advice for our web site clients, including on a private web site for them only. A: Search engines are computer programs and companies (like Google) that bring people seeking information to sites containing it. Q: How is priority placement obtained on search engine lists? A: Search engines list sites in the order of the number hits sites get, links among sites, fee-based premium placement, and other criteria. Although companies sell preferential placement, not all are a sound investment. Pay-Per-Click ads, where you only pay fees for the number of visitors who arrive from the ads, may sound attractive but are allegedly vulnerable to fraudulent charges (software programs can click on ads to inflate your costs and revenue for the ad company artificially; competitors can click on ads to increase your costs). Web Sites and Sound Bites?understands your work and how to present it to attract search engines and bring traffic to its web sites. In addition, we can submit a web site to over a thousand search engines, which not only list it, but have additional features and combine for powerful placement position. Then, we can help clients track traffic from a baseline, during typical periods of time, and evaluate traffic statistics. Of course, the most important criterion is the bottom line...whether a web site brings the desired business. Thus, we can devise strategies and fine-tune web sites to increase clients' ROI (Return on Investment), which is why they get a web site and why they are working. Q: Does it make sense to try a free web site from my phone company or Internet Service Provider? Offers for "free" web sites may not be free. The old expression "there is no such thing as a free lunch" is still true. Beware of attached strings: having to buy something you don't need in order to qualify, enabling telemarketers and spam mail to bombard you, your name as an appendage in a third-party's domain name, and a web site with its company's big ads on it. Hardly a classy look professionals want. A free site is not really a test drive. It may ruin your professional image. Negative results can discourage you so you never move to getting an effective web site. Meanwhile, you are wasting valuable time when you could be growing your business. You may be surprised to find the cost for a professionally designed web site can be the same as or even less than a do-it-yourself one. Q: How much does it cost to have a web site designed? A: Cost is an important consideration, but unless you are ordering an identical fill-in-the-blanks template from a mass producer, it cannot be stated without knowing what you want. Customized web sites do not necessarily cost more, but cost is determined by the amount of time involved. Some people want complex, lengthy web sites and others want a few pages. After speaking with potential clients, we write a detailed contract with a capped amount to assure not going over budget. Q: What are the seven most important features of a good web site? Q: What are the seven most important characteristics of a good web designer? Q: How do I evaluate whether a particular web designer is good for me? A: You can use the answers to the two previous questions to guide your evaluation. Look at many sites by many designers. Compare them, especially your competitors' web sites. Find out what characteristics you like and don't like. Be alert for unclear communication that defeats the purpose of a web site, which is to impart information. Sites that are cluttered and boring are turn-offs. Getting lost, links that go nowhere, empty boxes wtih "x"s where graphics should be, and dead pages are bad omens. Be wary of sites that have distracting dancing cartoons or are flippant or immature. Pay attention to web designers' priorities and how they promote their own work. If web designers say they don't aim to create the most attractive site, you can bet yours will neither be attractive nor have advertising savvy. Designers' own sites are as good as they get. Be sure to look at samples of other sites they did too. If they don't provide any, find another designer. Web Sites and Sound Bites?/font> is proud of its sites and encourages you to look at samples of its web sites. Therefore, the depth of the pressure produced by the equivalent of 4.5 tons of gravity in applying the replica watches glass mirror and case cover. This high-tech device by the internationally renowned French diving company COMEX (Compagnie Maritime d'Expertise) development and manufacturing, they specialize in underwater engineering and high technology, decades of cooperation with uk replica watches.Rolex Deepsea special titanium case cover, can make the replica watches can withstand the weight of the intact sea. Check references to be sure others are satisfied with the designer's work and even more importantly, the reasons why. You can see reference letters from clients of Web Sites and Sound Bites?/font> along with their web sites. In comparison shopping, don't compare apples and oranges, but the same items. Know what you are getting. Be sure everything is in writing and read the contract before signing it. Web Sites and Sound Bites? gives each client a clearly written contract, with all the details, including a capped amount. Distance is irrelevant since you will be communicating with the web designer on the phone and through e-mail and looking at drafts of the site in your own computer. Speak to the designer in advance to be sure this is the designer with whom you want to work. Clients are pleased that we place phone calls to them, saving them long distance charges. Be sure you will be shown drafts of your web site that are not visible by others for your reactions and your approval prior to its publication on the Internet. You can check businesses with the Better Business Bureau and other such organizations. Although web design is not a regulated profession, there may be special indicators of high standards. For example, Dr. Carol Goldberg of Web Sites and Sound Bites?/font> is a licensed psychologist, is entrusted with leadership positions in professional associations, and has served on ethics committees, indicators of high ethical and professional standards. Furthermore, clients are comfortable knowing private practice and business information they share with her is treated confidentially as are other consultations by psychologists, whereas they do not have this assurance from technicians and unlicensed consultants. Q: What mistakes should I avoid? avoiding spending any money to make money. While some of this has been stated in answers to other questions, here is a summary of key issues for those without time to read every Q/A. Donà¢?fooled by â¥?web sites. Be wary of their ä²©ngs attached?requiring other purchases; ads you have no control over, cheapen you, imply product endorsement, and distract from promoting your work; distracting animations; and sharing with your competitors. Don't believe the cost is what a company states if you have to write the text yourself, which is more time-consuming than having an experienced designer who knows your work write it for you. The real cost is the quoted amount plus the amount of time it takes you multiplied by your hourly income. Don't hire a web site company that only gives you its Internet address and only communicates by e-mail. Be sure you can talk to the designer on the phone. Check references, ownership, and the Better Business Bureau. Be sure the company is located in the United States so it is regulated by federal and state laws. When shopping, avoid comparing s and oranges.? Get a classy web site that shows you off uniquely. A customized web site does not necessarily cost more than a template site. Be sure you can talk to the designer to be sure your work and promoting it are understood. Be sure your domain names are registered to you (not to a host). Verify there is no monthly maintenance fee (an unnecessary rip-off). Q: What is media coaching? A: Web Sites and Sound Bites?/font> media coaching for TV and public speaking consists of stress managed coaching by Dr. Goldberg with work related material. It is in-person. Depending upon a client's goals, practice may be in front of a live audience in a workshop format. Practice for TV can be mock interviews recorded by a video camera; playback based feedback; and tapes or DVDs to keep and use for learning afterwards. In contrast, radio and print media coaching can be conducted on the phone and recorded for continued learning. Print media coaching can be mock interviews with questions journalists ask and tips about avoiding pitfalls and being misquoted. Throughout our media coaching, the emphasis is on becoming comfortable and effective promoting your work. Advice is provided for getting invitations to appear on TV and radio programs and in print media. Dr. Goldberg's media coaching is based upon her stress management expertise; extensive experience speaking publicly; being interviewed and interviewing professionals; being Host and Producer of a weekly TV program for over five years; being interviewed on the biggest national TV programs; formal training and experience in technical aspects of TV production; being a consultant to national media; and understanding the work of varied professions and businesses. She also has the technical skills to do photo and video editing for your web site. If you have other questions, please contact Web Sites and Sound Bites?/sup> via the e-mail link at the top of this page.